Nat Cole's "Route 66." Jack Kerouac's On the Road. Lucy and Desi's Long, Long Trailer. After World War II Americans hit the road in record numbers, and the pop culture machine couldn't help but take notice. In order to accommodate all this new tourist traffic, motor hotels sprouted like mushrooms—and rural communities, which had been suffering economically for years, were offered renewed hope as they profited from this emerging tourist industry. 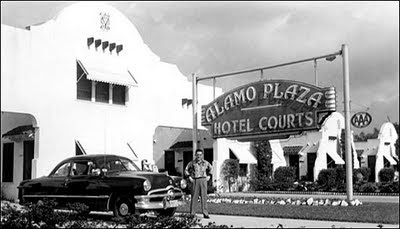 From the outside, at least, the Alamo Plaza Courts resembled a stucco Spanish mission. 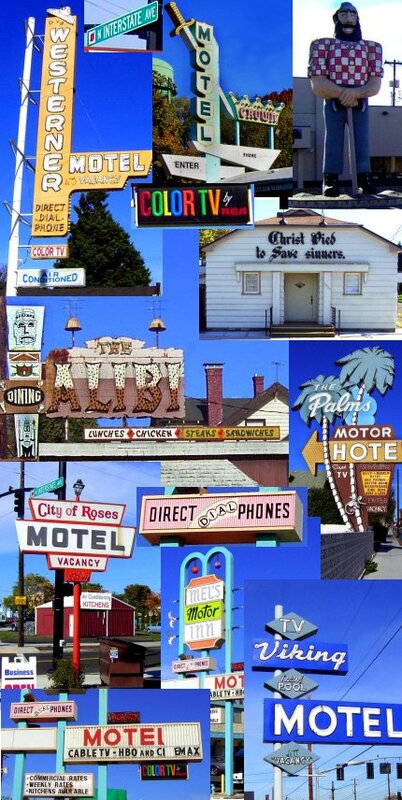 These cabin camps, cottage courts, motor courts, highway hotels and roadside inns were often jazzed up with elaborately stylized signage and architecture that took advantage of regional styles (and, occasionally, stereotypes). Owners employed adobe, stone, brick, or whatever else was handy or distinctive to attract guests. This all changed with President Eisenhower's Interstate Highway Act in 1956, which aimed to tie the nation's major cities together with a system of superhighways. By 1960, more than 10,000 miles of new asphalt was in place, propelling Americans into the future at high speed and no stops along the way. The grand old highways, and the hundreds of small communities that survived because of them, paid the price of this progress. Bypassed, their gas stations, motels and diners withered. While some of the roadside inns continued to eke out a living taking in the occasional tourist or trucker, most were abandoned or converted into residences. Americans in the cities and suburbs were enjoying a period of unprecedented prosperity, but their rural neighbors were beset by economic gloom. We have twelve vacancies. Twelve rooms, twelve vacancies. They moved the highway. I knew you must have. No one stops here anymore unless they do. Look closely when she signs the motel register, and you'll see that The Bates hadn't taken in a single guest in over eight months. Imagine the Bates' feelings when they were, in effect, put out of business by the new interstate that rerouted travelers away from their motel. No wonder Norman had an attitude problem. In fact, it could be argued that the real villain in Psycho is not Norman Bates at all, but those forces in our society that scuttled the American Dream for countless small town communities across the nation. Swanky sign. Not so swanky clientele. In 1960, Portland, Oregon, (my hometown) could still be called a small town. U.S. Highway 99 ran through the middle of the city and served both as a highway and a main artery for city traffic. Then, in the mid-'60s, U.S. 99 was replaced by Interstate 5. The portion of the old highway that runs through the north end of Portland was renamed Interstate Avenue. But when completed, the I-5 freeway, built several blocks to the east, offered precious few off-ramps to bring travelers to the businesses that had been built in hopes of serving this new generation of travelers. North Portland soon earned a reputation as a working-class community hopelessly on the wrong side of the tracks. This is the neighborhood I grew up in. By the time I came along, the motels along Interstate Avenue had fallen into neglect, offering guests rooms by the hour, the night and the week. The house that I grew up in during the '70s and '80s was one block off of Interstate Avenue, and it wasn't uncommon to see prostitutes in front of the Rose City Motel, or to see a police car lurch into the parking lot of The Viking Motel. The enormous sign of a local church warned passersby that "The wages sin pays is death" in brimstone-gothic lettering. Interstate Avenue was a neighborhood full of potential—or, who knows? literal—Norman Bateses. Miraculously, the vintage motels are still there. And their signage is a flamboyant theme park of neon and painted tin. Las Vegas in miniature. If they haven't been protected under the Historic Register Act, they should be. These signs harken back to an era when automobile travel was practiced as if it was a constitutional right, part of our Manifest Destiny. There's the Westerner Motel, an enormous metal plank topped by a jauntily tilted neon cowboy hat. I imagine a boy from another era persuading his parents to stop here for the night. After tucking their son in to bed, they'd sneak across the street to the South Pacific island-themed Alibi Restaurant for a cocktail in the Tiki Room, perfectly preserved with vintage Tiki idols and imitation grass roofs. You half expect Jack Lord to emerge from the men's room. The Palms Motor Hotel crouches behind a neon sign that is perhaps 40 feet tall and 15 feet wide. It features palm trees, monkeys, and a massive yellow illuminated arrow that points you toward the lobby. As a bonus, prospective guests are promised FREE TV. Not to be outdone by The Palms, the nearby Mel's Motor Inn offers wayfarers DIRECT DIAL PHONES and COLOR TV. By 1975, over 42,000 miles of superhighway had been built, relegating nearly half of the older U.S. Highways to the status of "bypass"—if they weren't decommissioned altogether. For many small towns that struggled for their existence even under the best conditions, the superhighway system was the final blow to their survival. Independently-owned motor courts were further marginalized by corporate chains like Motel 6, which opened its first location in Santa Barbara in 1962, attracting budget travelers at $6 per night. The thrill of discovering the unique atmosphere of a local roadside motel was eventually replaced by the bland assurances of sameness and efficiency. At one time, Paul Bunyan welcomed all travelers to Portland. The motels along Interstate Avenue are a reminder that prosperity is brief. For the residents of North Portland in the postwar years, the American promise of financial abundance was as empty as the grin on the Paul Bunyan statue at the corner of Interstate and Denver; the Great Dream as unattainable as a mirage on a California highway. US Route 30 runs from Chicago IL, through to Portland. It is a two-lane that is still favored by truckers when the interstates close due to blowing snow, and is a more scenic trip west by any mean. Good post. I'm a resident of NoPo, fully aware of the history of my neighborhood but unable to really appreciate it. Interstate Ave. is so clogged with cars, MAX trains and storefronts that have fallen into disrepair that it's hard to get a good impression of it. However, the kitschy landmarks that dot this (now seedy) stretch of road are a thought-provoking reminder of the area's past. Your conclusions serve a similar purpose. Hard to believe the historic 'interstate highway' was almost renamed. do you have any known information along with the name about a cabin motel built on sandy blvd. in portland oregon that has since been taken down? thank you.